Thoroughly Modern Millie is one of them. It belongs to the Holiday on Broadway Collection from 2003 (I believe). If I recall correctly I purchased this together with La Boheme as a set. That one was on my wish list for a very long time. Such a beauty! Anyway, this is a sheer slightly tinted base with silver micro glitter. The sheer base is somewhat duochrome. In some angles it seems pink/purple while in other angles I can see hints of green. Very unusual. I applied two coats over black undies here. The pick below shows the green better: Any thoughts about old polishes? Do you search the web to find that particular discontinued polish? I have another polish from OPI‘s Hawaii Collection for Spring to show you. This is two coats of Just Lanai-ing Around. I love these kind of vintage hue’s. The formula is good, as I’m used to with most OPI polishes. 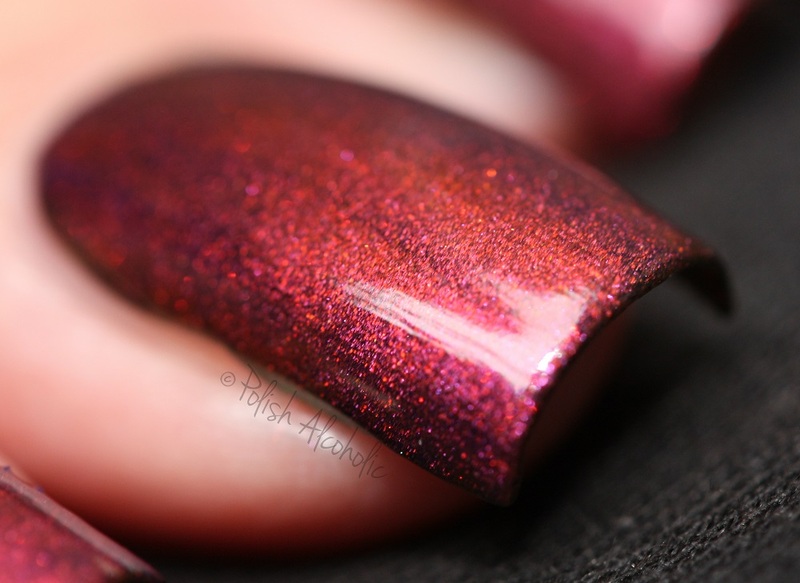 I used a make up sponge to apply Too Much of a Good Thing on the tips of my nails and added one coat of top coat (HK Girl by Glisten & Glow) for a smooth and glossy finish. This glitter topper is part of my Spring Collection which is available at my shop. 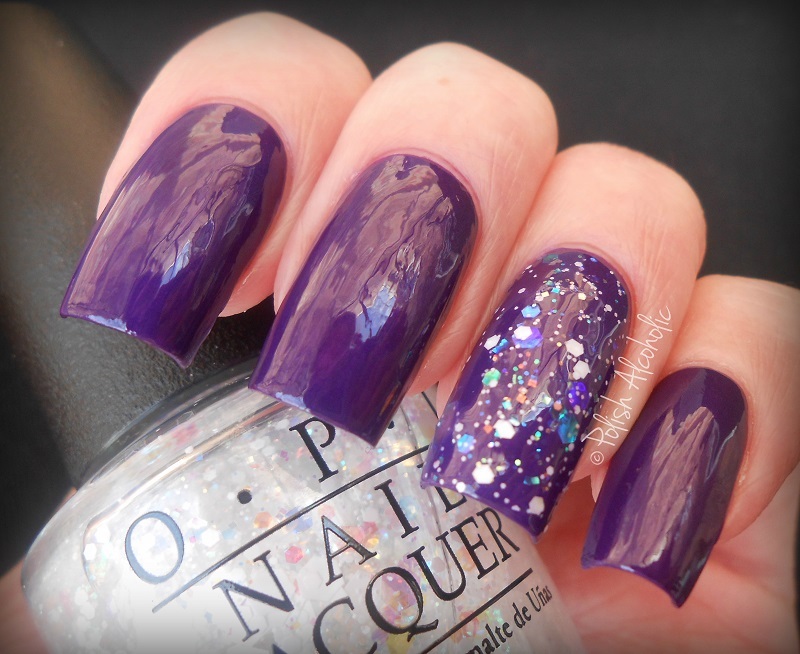 Today I have another polish from OPI‘s Hawaii Collection to show you. Let’s take a look at Go With The Lava Flow: It’s slightly more coral than shown here. This has a gorgeous golden shimmer running throughout which was reason enough for me to pick it up. Sadly, I couldn’t capture it with my camera. The formula is good. I used two coats plus top coat. What do you think of this one? OPI retails at € 14,95 a bottle here in the Netherlands. I get my OPI’s from Ebay which basically means that I can get three bottles from Ebay for the price of one here in The Netherlands (excl. shipping) 😉 In case your interested, click here to visit my favorite seller’s shop on Ebay. Formula is good. I used two coats here. For the ‘splatter’ design I used MoYou stamping plate number 13 from their Princess Collection and purple stamping polish (12) by Mundo De Unas. Speaking of stamping polish, this is my first Mundo De Unas and I love everything about it. It is super pigmented and works perfect with my XL stamper and scraper that I bought at Hypnotic Polish. I can’t wait to get my hands on more colors. They seem to be very popular since they sell out in an eye blink. At least at Hypnotic Polish. Lastly, I am dying to know your thoughts about Pineapples Have Feelings Too. You know what I’m talking about, the weirdest yellow/glitter combo existing on the planet. Everyone seems to hate it. 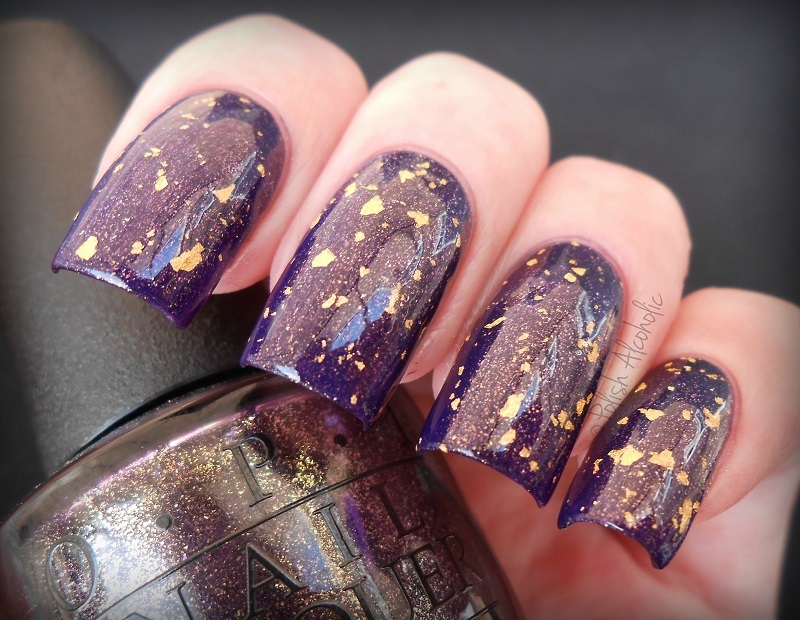 I love weird polishes but I’ll pass on that one. The yellow base has a frost (!) finish. If only it was a crelly or even a slightly shimmer finish I think I’d loved it. Such a bummer. Frost finishes are just not my cup of tea. 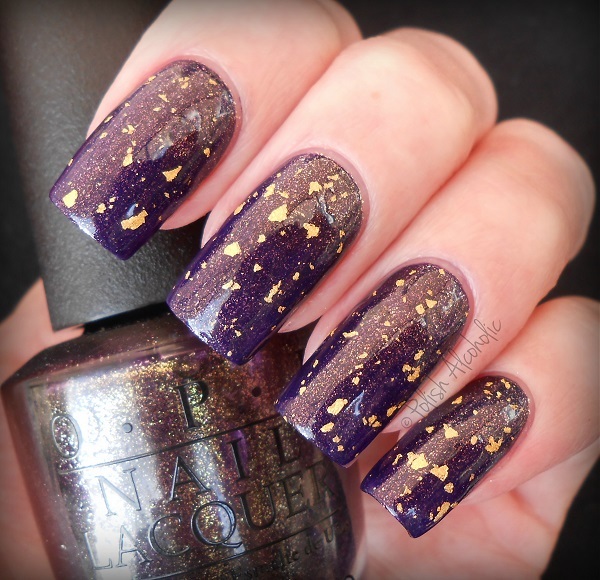 Today I have OPI‘s First Class Desires to show you which came out in last years Holiday Collection. Here’s a combo of two of the Holiday 2014 (Gwen Stefani) Collection by OPI: I used two coats of I Carol About You for my base color and added one coat of Snow Globetrotter on my accent nail. Snow Globetrotter is such a gorgeous glitter topper. It contains white and iridescent hex glitter in a variety of sizes. If you’re a fan of glitter toppers then this would be a nice addition to your stash. The formula of Snow Globetrotter is on the thick side but that didn’t gave me problems with application. Did you pick up any polishes of last years Holiday Collection?